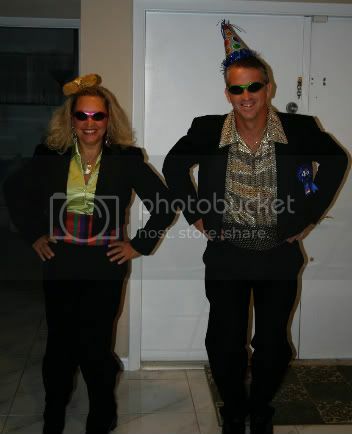 o wow you guys look great! 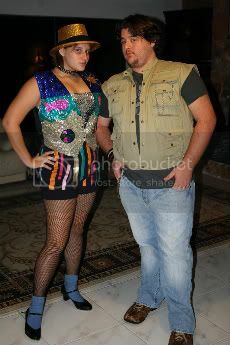 i need to find the rest of my halloween pics. it is so much fun!!!! AS i can dress up at work, and we have a halloween party at a bar afterwards, im going to be Cinderella, and have two costumes, one for work (that fits with the work costume code :ie, no long sleeves, nothing expensive, nothing that covers your face, nothing to grossume, nothing that can be taken as a sexual costume, able to wear your name tag, be able to have your hair back, and no long wigs. ) And i also have to wear an apron, so i figured i'd be cinderella with her wicked steps at work, and than at the party i'd tottally dress up, and im making a mask to go with it YAY! 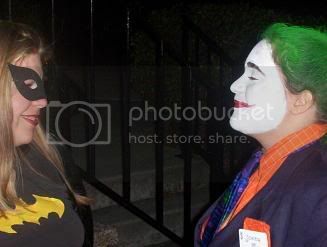 I have always loved making my own costumes, a couple years ago I put together a Joker femme costume and my sister was batgirl. 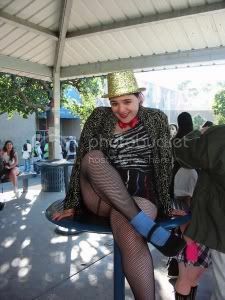 the next halloween, I got really into Rocky Horror and made myself a Columbia costume. OMG! I love them!!!! i went to the rocky horror audience participation last month, with my boy and parents. those are great costumes! My boy and I want to be the yip yip aliens from Sesame street. Walk around going "yip yip yip yip yip....uh huh huh." 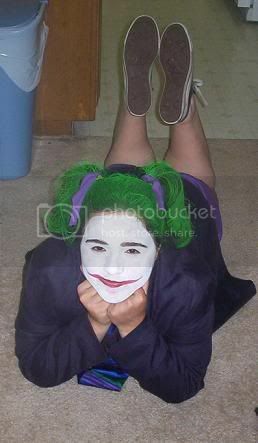 :o i love the joker costume! I want to dress up this halloween. I have my fingers cross to be out of the wheelie(wheel chair) by then. I start physical therapy next friday! woot!